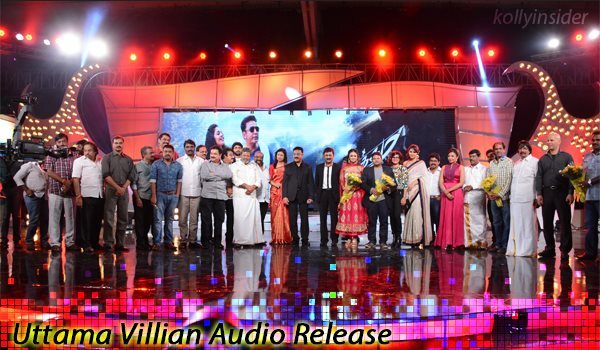 Kamal Haasan's Uttama Villain trailer and audio was released on Sunday, 1 March 2015 at Chennai Trade Centre in Nandambakkam, Chennai. Employing characteristic out-of-the-box methods, Kamal Haasan launched the audio of his upcoming film Uthama Villain on an app, instead of conventional CDs in a function at the Chennai Trade Centre on Sunday. The event commenced at 5pm. The cast and crew along with other celebs graced the function and performed at the event. At the launch, while on stage, he called his daughter Shruti, who was in Mumbai, on Facetime. Shruti, not knowing that her father was launching the app with the audio, was chatting away with her father about day-to-day affairs, when Kamal Haasan revealed that she was being seen by over 1,000 fans and special invitees eagerly waiting for the audio launch. A panel discussion involving Kamal Haasan, Parthiban, Madan Karky and Villupaatu Subbu Arunachalam followed which droned on and after over two hours, the crowd was beginning to thin. Sensing the crowd’s impatience, the film’s Lingusamy intervened, “Shall we go on to launch the audio?” causing the discussion to be cut short. The audience was then treated to a sneak peek into the visuals of a couple of songs of the late K Balachander, who was instrumental in bringing out the latent talents of Kamal Haasan and music director Ghibran, laced with the wit of actor Parthiban who hosted the show. The event was not without controversies. A number of fans with ‘Fan’ and ‘VIP’ passes were not let in due to lack of space. “I have been an ardent fan of Kamal for 25 years. I came here at 5 pm, hoping to get a glimpse of the actor. But there were not enough seats,” rued one of them. The films has a total of 17 tracks composed by Ghibran, including seven songs, seven background scores and three karaoke numbers. Ghibran received accolades for the background score of the trailer. 'Uthama Villain' will be the first Tamil film to release the background score of the movie along with its songs. Meanwhile, the audio has been formally released on stores. The music is getting amazing response from the audience and critics. Juke Blume, Graham Fotte, and well-known ethnic wind instrument musician Sandro Friedrich have also worked on the movie's music. The film has been directed by Ramesh Arvind whereas the dialogues have been penned down by Kamal Haasan. The film also stars Urvashi, Andreah Jeremiah, K Viswanath, Pooja Kumar, Nasser, Jayaram, MS Bhaskar and Parvathi Menon. Legendary filmmaker K Balachander will make a special appearance in the movie. The film is slated to hit the screens on 2 April. Thirrupathi Brothers & Raaj Kamal Films International presents Uttama Villain Trailer 2. Starring: Kamal Haasan, K Balachandar, K Vishwanath, Jayaram, Urvasi, Pooja Kumar, Andrea.